One of the best things I’ve done in a long time is to invite my readers to send in their requests for my Best Inexpensive picks. I’m not sure why I love it so much, but I think it may have something to do with satisfying my inner shopper without actually shopping. 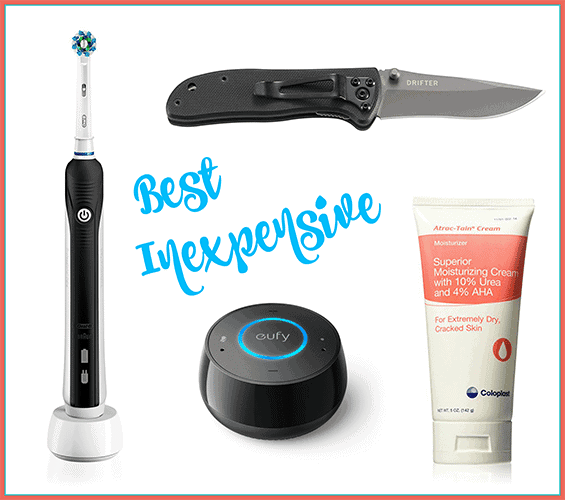 At any rate, today I’m excited to reveal my Best Inexpensive picks for four completely unrelated, but frequently requested items. ELECTRIC TOOTHBRUSH. I’ve gone to the same dentist for so many years, I’m sure he’d be embarrassed if I told you here. Know how much I trust and depend on Richard Oliver, DDS., La Palma, Calif.? I now live 1,100 miles away, but he’s still my dentist and I still show up for regular cleaning and check-ups. Dr. Oliver believes so strongly in the effectiveness of a good electric toothbrush, he gives his patients a new brush head for their particular model, every visit. However, my pick for the Best Inexpensive electric toothbrush is the Oral-B Pro 1000. Here’s why: It’s a great tool, works like a champ and gets awesome reveiws. Oral-B Pro 1000 has a built-in timer so I know I have to keep going at it until it gives me an alert that I’m done—but also a pulse every 30 seconds so I know when to switch areas. The replacement toothbrush heads for this brush are inexpensive, which is a big deal. This brush holds a charge for many days, making it ideal for travel. The manufacturer claims this Pro 100 removes 300% more plaque than a regular manual toothbrush. FOLDING KNIFE. Having all sons and one husband, I’m know how much many men enjoy and depend on a decent pocket knife. In my family, I’ve joined those ranks. I love having a good, dependable cutting tool in my handbag. And I know the heartache of losing my favorite, well-used and always sharp knife. That’s when it’s good to know I carry the best that is also inexpensive. My pick for Best Inexpensive pocket knife: Columbia River Knife and Tool with Plain Edge. Some days I just have to smack myself in the forehead. Why didn’t I think of that?! Doesn’t it make sense that by now someone would have come up with a simple, inexpensive gadget to clean an icky, stinky garbage disposal? It make sense to me, and guess what? Someone has! Regardless what the calendar reads, I know without a doubt that where I live in Northern Colorado, fall has arrived. It’s not evident necessarily by a change of temperature or even trees beginning to turn color because both are still very summer like. Around here it’s tiny, annoying, persistent fruit flies that signal that autumn cannot be far away. Apparently, I am not the only one noticing this. 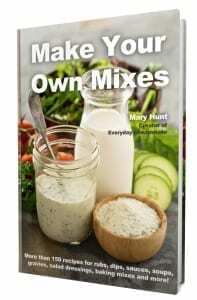 Dear Mary: I have been having a real problem with fruit flies. I’ve tried numerous remedies and I get a few, but they’re still everywhere! I don’t have any fruit out. No open bottles of booze. I just can’t seem to get rid of them. PLEASE HELP!!! J.W. Dear J.W: Fruit flies can be a problem year round, but are especially common during late summer/fall because they are attracted to ripened or fermenting fruits and vegetables. They may not be in your house, but your neighborhood and community is likely enjoying a harvest of tomatoes, melons, squash, grapes and other perishable items, which are breeding grounds for these tiny critters. Fruit flies are also attracted to rotting bananas, potatoes, onions and other unrefrigerated produce purchased at the grocery store. All it takes is one pregnant fruit fly to get in and before you know it, you’re dealing with a full-fledged fruit fly infestation. I know. I’ve been battling this problem, too! See that photo above? That’s a picture of one of my fly traps, so I know this works. 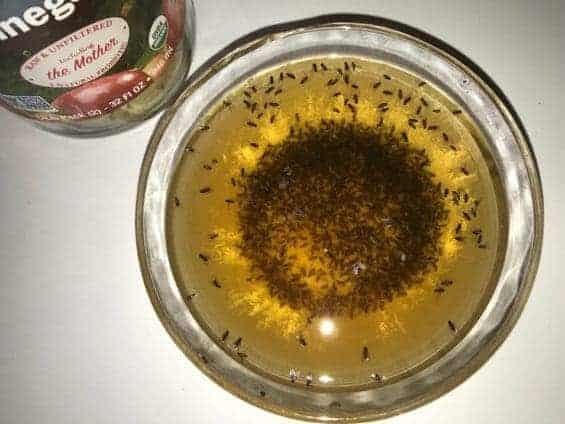 To make your own fruit fly trap, assemble these supplies: a small glass bowl, plastic wrap, apple cider vinegar (no other types of vinegar or juice) and blue Dawn. I gave my son and daughter-in-law lots of gifts when their son Elijah was born. But none has come back to bless me more than the Gift of Friday. Since he was six weeks old, I’ve closed the door to work on Fridays to care for and learn from my grandson, Eli. In these two years, Eli and I have explored our neighborhood looking for cats, dogs, bugs and birds. We’ve met neighbors we didn’t know and found the skunk we knew existed but had never seen. We’ve played at the park, counted planes and listened for fire engines. Last week, we took a walk to the 99 Cents Only store to see if we could find anything from the movie “Toy Story.” I was fully prepared to shell out a buck or two if indeed we could find anything. I figured it was doubtful, given the kind of store it is. But the most amazing thing happened. Before we could even get through the door, Eli locked eyeballs with Buzz and Woody on a gift bag. I was surprised and reacted with great drama, which made him laugh hysterically. As we walked up and down the aisles, Eli made one “Toy Story” discovery after another. I would have never noticed the things he found, from photo albums to stickers, books, pencils, gift bags, cups, plates, cards, key chains and other “Toy Story”-branded trinkets. The more things he found, the more I reacted, which only spurred him on. Here is where Eli and I are not at all the same: He didn’t want any of these things. He just loved finding them. The fun of discovery became its own reward. I, on the other hand, have some kind of automatic response mechanism that insists that if I love it, I must then buy it. I learned a couple of important lessons from Eli that Friday. First, I don’t have to own things to enjoy them. Isn’t that an amazing thought? And it goes the other way, as well. Just because I don’t own it doesn’t mean I cannot enjoy it from afar. Second, often there’s greater value in doing things together, than in owning things. Creating this little game, and then beating me at it over and over, provided Eli with so much fun and enjoyment, the thought of actually buying all that stuff didn’t seem to cross his mind. He loved doing more than getting. You bet we will, Eli. And next week we’ll look for cars, trucks and anything green. And we’ll count the cracks in the sidewalk and look for caterpillars. We’ll laugh and run and count to 20. We’ll enjoy every minute and make memories for a lifetime without having to buy a thing. Update: I wrote the foregoing in my journal more than six years ago. In what seems like a blink of an eye, Eli is now 8. Since then, little brother Sam has joined our Fun Friday adventures. While it has little resemblance to the 99 Cents Only store, Costco is the place Sam, age 2, and I look for hidden treasure. He prefers Mickey Mouse to Toy Story, and sure enough, without fail, he discovers that mouse over and again on merchandise, posters and displays that I would never notice in a million years! About 20 years ago there was a pressure cooker renaissance in America. Our grandmothers knew that day would come, that we would return to her favorite kitchen tool—a pressure cooker—to make fast braises, stews, soups, and casseroles. They just didn’t know how we’d get there. 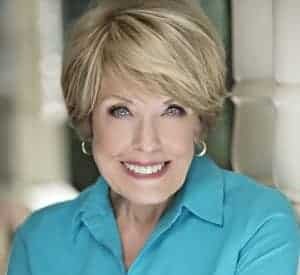 If you, like me, are a Nervous Nellie who grew up hearing stories about a great aunt who shellacked her ceiling with country stew when the thing nearly blew her to Oz and back, relax. I’ve powered through the fear and discovered modern pressure cookers have amazing safety features to put all fear to rest. Now it’s time for you to start exploring as well, especially if you’re busy, hate spending hours in the kitchen but hate even more having to go out and spend a fortune on a marginally edible restaurant meal. Perhaps you impulse bought an Instant Pot—on a whim and now it sits unopened in the garage, nearly forgotten. Or it’s been on the countertop for months and truth be told, you don’t have a clue what to do with it. Or it’s possible you have used Instant Pot, tried it once and it turned out to be a complete disaster. The pot roast turned out dry and tough as shoe leather. The pasta came out a frothy, sloppy mess. 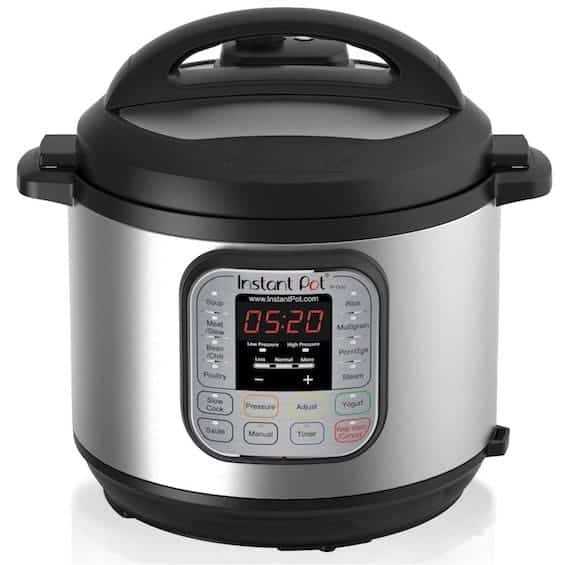 Disappointment, thy name is Instant Pot. Whatever your situation—even if you’ve never heard of a pressure cooker let alone how or why you need to—today’s the day. It’s time to put away all preconceived notions, rumors, and failures and start over on the right foot. IT’S DIFFERENT. Pressure cooking is a completely different kind of cooking. You can’t just throw stuff in willy-nilly and expect perfection five minutes later. There are rules, which when followed, pay off in spades. But you have to know them, learn them and follow them. It’s not hard, but it is completely different than what you might be used to. In my lifetime, I have spent way too much in an attempt to furnish bedrooms and baths with high quality towels and bedding. What I have discovered through a lot of trial and error is that the price does not always guarantee great results. Today I want to tell you about my picks for the Best Inexpensive bath towels, mattress pads and down (the real deal) comforters. TOWELS. I’m sure you won’t be surprised to learn that when it comes to towels, my husband and I are both very picky. They can’t be too thin, but not too thick either. Towels need to be highly absorbent, 100% cotton. We’re not into bath sheets, preferring our bath towels to be somewhere around 30” x 56.” They need to be soft but not too soft, so as not to give an invigorating rub down following a hot shower. I want towels that launder well—able to handle hot wash, vinegar rinse and a high-temperature dry with wool dryer balls. 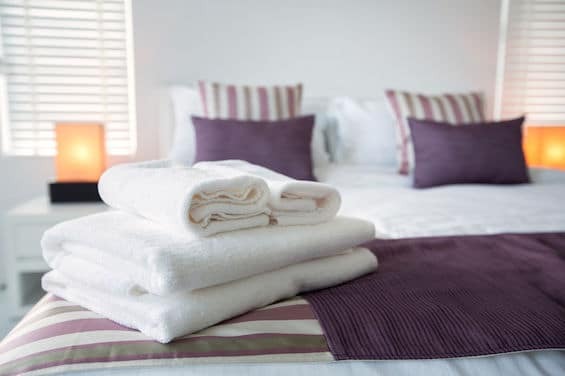 We stick with all white linens, so our towels need to be able to handle an occasional bit of chlorine bleach. My pick for Best Inexpensive bath towels is Land’s End 100% Rare Supima Combed Cotton towels, hand towels, and washcloths. These are amazing towels. They do not shrink, launder beautifully and look gorgeous hanging in the bathroom. These towels come singly or in sets and in a choice of 15 colors, including white. 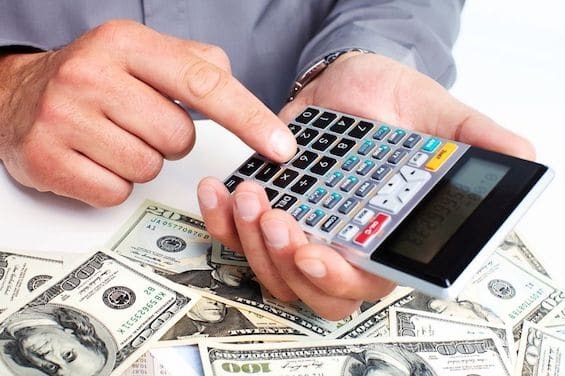 A reader question I answered some time ago brought a small avalanche of mail, mostly from readers who were aghast that I would suggest they save such a significant portion of their paychecks for retirement. It was money they just didn’t think they could afford to save. I have a long list of reader questions that I’d intended to answer today. But I got so taken away with Sandy’s question, I used up all the space! I promise to get to the rest of the list real soon.